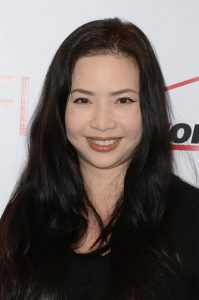 As one of the few Asian American producers in Hollywood, Nina has gained a positive reputation for having an in-depth knowledge of film financing, creative and physical producing, and a knack for discovering talent, like that of Ryan Coogler (Marvel’s Black Panther), whose first film, “Fruitvale Station,” was produced by Nina and her producing partner, Forest Whitaker. Together under their banner, Significant Productions, Nina and Forest have produced a number of critically acclaimed and monetarily successful films by auteur directors—all filmmakers of color, including “Dope” (2015) by Rick Famuyiwa, “Songs My Brothers Taught Me” (2015) by Chloe Zhao and “Roxanne Roxanne” (2017) by Michael Larnell, all of which debuted at the Sundance Film Festival in U.S. Dramatic Competition over the past three years. Proudly, “Fruitvale Station,” “Dope” and “Songs My Brothers Taught Me” also premiered internationally in Cannes proving that ‘films of color’ do travel. Nina’s mission is to create opportunities and inclusivity for underserved and underrepresented storytellers. Her most recent film, “Sorry To Bother You” by Boots Riley debuted at Sundance in January 2018, which is her 5th in U.S. Dramatic Competition. She is currently in active development of the Angela Davis feature biopic with Lionsgate alongside a slate of projects that she loves. Nina is a board member of Film Independent, The Oscar Grant Foundation, Coalition of Asian Pacifics in Entertainment (CAPE), as well as a member of The Academy of Motion Pictures Arts & Sciences’ (AMPAS) Producers Branch. She’s fluent in Mandarin, Chinese, and received her graduate degree in Entertainment Management from the Annenberg School at the University of Southern California.